Alec Baldwin and Kevin Spacey are expected to visit Capitol Hill to press Congress to preserve arts funding amid budget cuts. However, a hearing at which the actors were to testify Tuesday has been canceled. A spokeswoman for the House Appropriations Committee says some hearings have been canceled to free up time for staffers, who are helping members of Congress with budget negotiations to avoid a government shutdown. Hundreds of arts advocates will join Baldwin and Spacey and plan to visit each House and Senate office. Some congressional Republicans have called for a $40 million cut to the National Endowment for the Arts. Sarah Palin has called the spending "frivolous." The group Americans for the Arts cites research showing NEA funding spurs job creation and economic development. Meanwhile, Spacey seems to have found time to enjoy his trip to D.C. On Monday he tweeted out a picture of himself on a red Capital Bikeshare bike outside of the White House. "My White House tour, that had a very small carbon footprint in D.C.," Spacey tweeted. 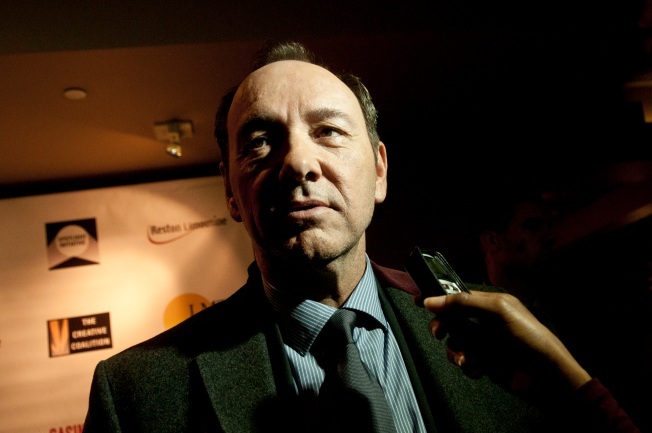 Spacey also gave a speech Monday night at the Kennedy Center for the American Alliance for Theatre and Education.